The Man From U.N.C.L.E. TV show was a very popular 60 minute spy thriller action series on NBC that was often referred to as the small screen equivalent to the "James Bond" movies. 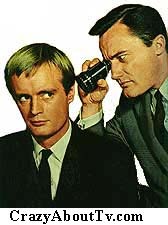 Napoleon Solo and Illya Kuryakin are the two top agents at U.N.C.L.E. They combat the forces of evil throughout the world using their abilities and high-tech gadgets and even manage to impress the ladies along the way. Their main enemy was an organization of criminals named T.H.R.U.S.H. Talk about guest stars! The Man From U.N.C.L.E. TV show sure got the big names of the time! In a very select list of the best-known, here are some of them: Eddie Albert, Eve Arden, Judy Carne, Joan Collins, Joan Crawford, Robert Culp, James Doohan, Barbara Feldon, Norman Fell, Jill Ireland, Werner Klemperer, Martin Landau, Angela Lansbury, Janet Leigh, June Lockhart, Jack Lord, Gavin MacLeod, Darren McGavin, Leslie Nielsen, Leonard Nimoy, Carroll O'Connor, Slim Pickens, Cesar Romero, Kurt Russell, William Shatner, Nancy Sinatra, Sonny & Cher and Vincent Price. To name a few! If you thought Robert Vaughn's acting ability is why he came off as so intelligent on the show, guess again! He completed a Ph.D. in communications. His doctoral thesis was about the blacklisting of accused communists in the entertainment industry. The success of the Man From U.N.C.L.E. became so huge by 1966 that it totally transformed Robert Vaughn and David McCallum's lives. Vaughn has said that he actually became a recluse in his home because teenage girls would climb over his wall and hide in the bushes. They'd even climb trees to try to catch a view of him in his bathroom. He was deluged with love notes and marriage proposals. David McCallum tried to go for a walk one day on Fifth Avenue in New York City and he was mauled so badly that police had to be called to rescue him. He also ended out pretty much staying home most of the time. The Man From U.N.C.L.E. was not an immediate success. It became so popular by the end of the first season, however, that it inspired the airing of several other spy shows. The best known are: "Get Smart (1965)", "I Spy (1965)", "Mission Impossible (1966)", and (of course), "The Girl from U.N.C.L.E. (1966)". Narrator: "In New York City on a street in the East Forties there's an ordinary tailor shop ... or is it ordinary? We enter through the agents' entrance and we are now in U N C L E headquarters. That's 'The United Network Command for Law and Enforcement'. U.N.C.L.E. is an organization consisting of agents of all nationalities. It's involved in maintaining political and legal order anywhere in the world." Napoleon Solo: "My name is Napoleon Solo. I'm enforcement agent in Section 2 here. That's Operations and Enforcement." Illya Kuryakin: "I am Illya Kuryakin, I am also an enforcement agent. Like my friend Napoleon, I go and do whatever I am told to do by our chief." Alexander Waverly: "What, Oh, yes. I'm Alexander Waverly, No. 1. Section One. In charge of this, our New York headquarters. It is from here I send these young men on their various missions." 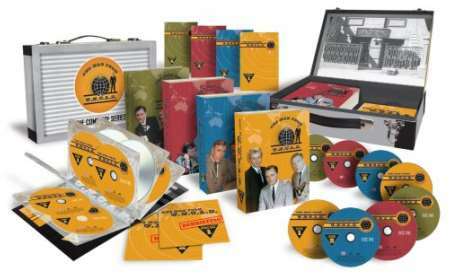 The Complete Series on 41 Dvds! Thank you for visiting our Man From U.N.C.L.E. page!